Ph.D. in Plant Pathology is a three-year course, minimum eligibility for which is Graduation in Biological Science or Agriculture, completed from a recognized university. Subjects studied under this degree are Advances in crop growth and productivity, Advances in weed management, Irrigation management, Stress crop production and Applied Plant Pathology & Recent Advances in Plant Pathology. The average tuition fee for this course ranges between INR 1 to 9 Lacs for the full course. The final selection will be based on the test score, academic profile, and an interview. The mode of admission is through an Entrance Examination carried out by different universities. Ph.D. in Plant Pathology can work as Researcher, Plant Specialist, Plant Pathologist, Teacher, Health Educators, Health Manager, Consultant etc. Such graduates can work in many areas like Agricultural consulting companies, Agricultural firm, Agricultural Research Service, Agrochemical companies, Animal & Plant Health Inspection Service, Biological control companies, Biotechnology firms, Botanical gardens, Colleges and universities, Diagnostic laboratories, EPA (Environmental Protection Agency), Forest Service, International agricultural research centers, Lawn and landscape maintenance firms, etc. with average starting salary between INR 2 to 30 Lacs per year which would only increase with experience in the field. Course Fee INR 1 to 9 Lacs p.a. Average Starting salary INR 2 to 10 Lacsp.a. Top recruiting companies Agricultural consulting companies, Agricultural firm, Agricultural Research Service, Agrochemical companies, Animal & Plant Health Inspection Service, Biological control companies, Biotechnology firms, Botanical gardens, Colleges and universities, Diagnostic laboratories, EPA (Environmental Protection Agency), Forest Service, International agricultural research centers, Lawn and landscape maintenance firms, etc. Ph.D. in Plant Pathology: What is it About? Ph.D. in Plant Pathology is essentially aimed at offering eligible candidates an advanced learning in plant diseases and their management. The program plays a vital role in familiarizing students with issues relating to crop protection, environmental issues caused by excessive use of pesticides, disease-causing organisms in plants, Factors that are responsible for plant epidemics and their effective protection from pathogens, and Technical training in emerging uses and effects of pesticides on plants. Topics such as pathogens, pests, plant disease resistance, transgenic, biotechnology and Genetically Modified Organisms (GMO) are also part of Ph.D. in Plant Pathology syllabus. The course help students in identifying and managing plant diseases, environmental friendly applications for plant protection and Tools for handling research work in all areas of plant pathology. The program lays emphasis on research methodology and enhancing analytical thinking skills in students for handling plant-related problems and solving them effectively. Students are exposed to lessons in theory, practical, seminars, demonstrations, field visits, and group discussions and given the first-hand experience. Ph.D. in Plant Pathology aims at sharpening the skills of eligible candidates in the various techniques and processes associated with plant protection. 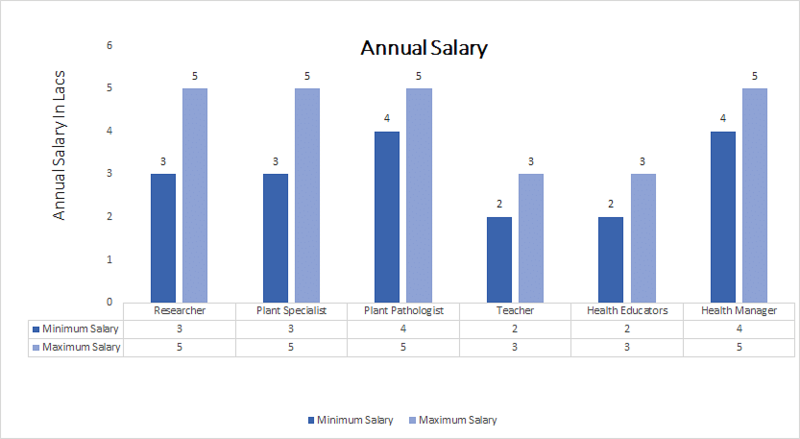 Both government and corporate sectors offer attractive compensation packages to pathologists. The admission is purely based on the merit and the medical colleges and universities conduct common entrance examination for the candidates. The eligible candidates from the written examination will be called for the counseling and interview process. Admission to the course is provided to eligible candidates on the basis of performance in a relevant entrance examination, which is conducted either by the concerned institution or at the State or national level. A cut-off score is set for the examination and students clearing that are eligible for the counseling process. The counseling process comprises two additional rounds of Group Discussion and Personal Interview, wherein the candidate’s general aptitude for the course is examined, and seats are allotted to qualifying students. Plant Pathology postgraduates can work as Plant Geneticists, Plant Breeders, Aquatic Botanists, Limnologists, Physiologists, Plant Pathologists, Professors, Consultants, and Agricultural Engineers or Inspectors at the district or State levels. They are hired for roles such as marketing officers, professors, plant breeders or logistic coordinators, pest control, field and forest officers, managers. Research units, botanical gardens, forestry etc.